Volatiles from aqueous extract of peppermint commercial sachets were investigated through gas chromatography/flame ionization detection (GC/FID) and GC/mass spectrometry (MS). Samples were prepared under similar conditions as in homemade tea. Volatiles were isolated using solid phase extraction method (SPE) with Porapak Q trap followed by desorption with acetone. Estimated mean values for short and medium chain carboxylic acids (C2-C12) and ketones lay in the range of 50-64 μg kg-1 whilst aliphatic alcohols and acyclic hydrocarbons had values lower than 6 μg kg-1. The major volatiles were terpenes (275-382 μg kg-1) that reached 89 % of the total composition. A total of 16 compounds, among them dodecane, acetoin, acetol, citral, geraniol and octanoic acid have been described by the first time in peppermint tea. These findings could be attributed to the different analytical approach employed, mainly to the use of different extraction/pre-concentration techniques. Given the apparently lower proportion of terpenes in the aqueous extract it may be that the chemical properties of the peppermint essential oil are not entirely reproduced with homemade tea. Estudo da composição da fração volátil do extrato aquoso de sachês de hortelã pimenta (Mentha piperita L.) através da extração em fase sólida. O princípio desse trabalho foi investigar a fração volátil do extrato aquoso de sachês comerciais de hortelã pimenta usando cromatografia gasosa com detectores de ionização em chama e de massas. As amostras foram preparadas em condições similares às usadas para o preparo do chá caseiro. Os compostos voláteis foram isolados via método de extração em fase sólida com adsorvente Porapak Q e eluídos com acetona. Uma estimativa dos valores médios dos ácidos carboxílicos de cadeias média e curta ficou na faixa de 50-64 μg kg-1, enquanto alcoóis alifáticos e hidrocarbonetos acíclicos tiveram valores menores do que 6 μg kg-1. Os terpenos (275-382 μg kg-1) foram os compostos majoritários alcançando 89 % dos sólidos totais. Um total de 16 compostos voláteis, entre eles, dodecano, acetoína, acetol, citral, geraniol e ácido octanóico foram descritos pela primeira vez no chá de hortelã pimenta. Esses resultados poderiam ser atribuídos aos diferentes métodos analíticos empregados, principalmente devido ao uso de diferentes técnicas de extração e pré-concentração. Em função da proporção menor de terpenos no extrato aquoso é razoável especular que as propriedades químicas do óleo essencial da hortelã pimenta não sejam totalmente reproduzidas com o consumo do chá caseiro. Peppermint tea is one of the most widely consumed infusions. The list of beneficial actions of the tea based on in vitro and animal models and human studies include: antioxidant, antimicrobial actions and benefits to digestive tract (1). Although tea is widely consumed, little is known about its aroma. However, a scientific group, to our knowledge, has studied beverage volatile composition. Only terpenes were obtained by simultaneous distillation and extraction since hexane was used as solvent. Unfortunately, GC/MS was not used thus compounds were only tentatively identified (2). In general, herb volatiles are usually extracted through distillation methods (3). The SPE on the other hand has not yet been employed for isolating volatiles from Mentha piperita tea although was widely used in diverse food matrixes (4). The use of other extraction techniques could contribute to an overall view of the peppermint aroma composition. The objective of the present work was to investigate the composition of the volatile fraction from the peppermint extracts made in homemade conditions. The extracts were enriched by SPE and analyzed through GC techniques. Six different brands of peppermint sachets (reliable providers) were analyzed. Acetone was from Merck (Germany), Porapak Q (50-80 mesh) from Supelco (USA) and standards from Aldrich (USA). Isolation of volatiles was based on a previous method (5). Sachet (2 g) was infused in boiling water (50 mL) with shaking (10 min). The extract was cooled with tap water (10 min), filtered by gravity, adjusted to 100 mL and passed (flow rate = 1.5 mL min-1) through a Porapak (700 mg) trap. Column was washed with 20 mL water. Volatiles were eluted with 100 mL acetone and concentrated to 200 μL at 20oC. A Carlo Erba 4300 GC/FID (Italy) and a Shimadzu 17A/QP-5050 GC/MS (Japan) were equipped with a SupelcowaxTM 10 column (USA) (30 m x 0.25 mm with a film thickness of 0.25 mm). The oven was 50-230ºC at 3ºC min-1 holding 230ºC (20 min). The FID and ion source (m/z 20-300) were 240ºC and injector (split 1:20) was 230ºC. Quantification was done by external standardization. 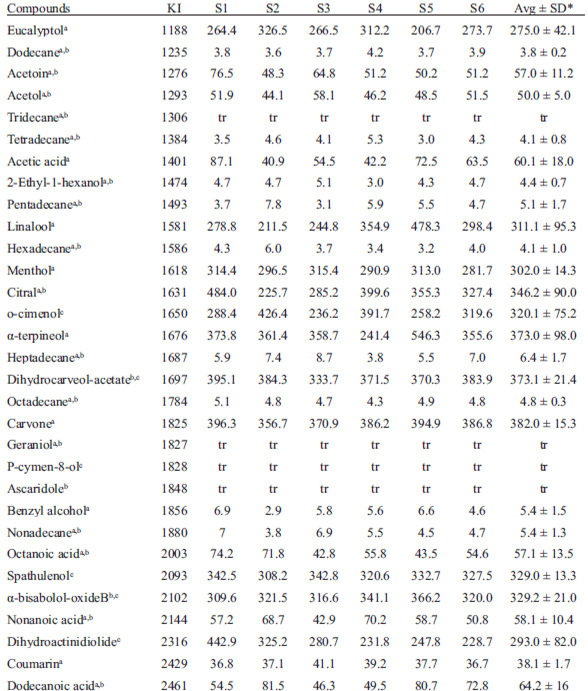 Volatiles identified by GC/MS via library data and standards (eucalyptol, dodecane, acetoin, acetol, tridecane, acetic acid, 2-ethyl-1-hexanol, pentadecane, linalool, hexadecane, menthol, citral, α-terpineol, heptadecane, octadecane, carvone, geraniol, benzyl alcohol, nonadecane, octanoic acid, nonanoic acid, coumarin, dodecanoic acid) were considered definitely identified. Other volatiles were only identified by GC library data. Statistical analysis of data (average and standard deviation) was performed using a statistical graphics system. Table 1 lists 31 compounds from peppermint aqueous extract identified by use of GC/MS and GC/FID. Among them, some hydrocarbons, terpenes, acids, alcohols and ketones were reported as herb extract constituents for the first time. The majority of volatiles were terpenes (45% of all), acyclic hydrocarbons (26%) and carboxylic acids (13%). Volatile fraction also contained low levels of ketones (6%), aliphatic alcohols (7%) and coumarin (3%). Terpenes were found in lower diversity (14 compounds) when compared to the essential oil (70 compounds) described elsewhere (2, 3). Estimated mean values for short and medium chain acids and ketones were 50-64 μg kg-1 whilst alcohols and acyclic hydrocarbons had values lower than 6 μg kg-1. Major volatiles were terpenes (275-382 μg kg-1) that reached 89 % of the total. These results agreed, in part, with those from literature which reported more than 98% by volume of the volatiles represented by terpenes (3). FIGURE 1. GC profile of the sample and of some standards. 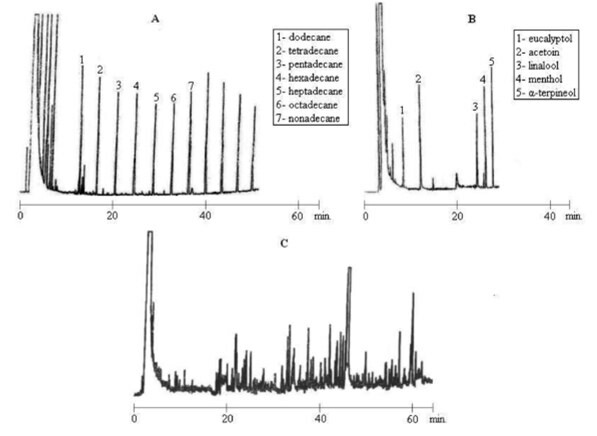 A – Standards of hydrocarbons identified in the samples and used in the Kovatz Index (KI) analysis; B – Some standards used in the definitive identification of volatiles in the tea samples; C – GC profile of the S1 tea aqueous extract. TABLE 1. Volatiles identified in peppermint aqueous extract. Concentration expressed in μg Kg-1. This work used similar general conditions as in the homemade tea that is usually done by means of non exhaustive extraction with boiling water. The use of adsorptive chromatography with Porapak Q polymer allowed the identification of volatiles in peppermint aqueous extract without additional heating. Enrichment of volatile fraction in adsorbent trap followed by desorption with acetone provided eluates with similar odors to original herb extract. A total of 16 compounds (acetoin, acetol, citral, geraniol and octanoic acid, among others) were definitively identified and reported as peppermint tea constituents for the first time. These findings could be due to the different analytical approach employed mainly to the use of different preconcentration technique. It may explain the higher amount of oxygenated terpenes over others non-oxygenated and the presence of acyclic hydrocarbons, carboxylic acids, ketones and alyphatic alcohols. Given the apparently lower proportion of terpenes in the aqueous extract it may be that the chemical properties of the peppermint oil are not entirely reproduced with tea. The authors thank FAPERJ and CNPq for financial support. McKay LD, Blumberg BJ. A review of the bioactivity and potential health benefits of peppermint tea (Mentha piperita L.). Phytother Res. 2006; 20: 619-633. Orav A, Kann J. Determination of peppermint and orange aroma compounds in food and beverages. Estonian Acad Sci Chem. 2001; 50: 217-225. Güntert M, Krammer G, Lambrecht S et al. Flavor Chemistry of peppermint oil (Mentha piperita L.). In: Takeoka GR, Güntert M and Engel KH (eds), Aroma Active Compouns in Foods: chemistry and Sensory Properties. Washington, DC: American Chemical Society. 2001; 119-137. Shimoda M, Shigematsu H, Shiratsuchi H, Osajima Y. Comparison of the odor concentrates by SDE and adsorptive column method from green tea infusion. J Agr Food Chem. 1995; 43: 1616-1620. Moreira RFA, Trugo LC, Pietroluongo M, De Maria CAB. Flavor composition of cashew (Anarcadium occidentale) and marmeleiro (Croton species) honeys. J Agr Food Chem. 2002; 50: 7616-7621.